The bulk of the collection I have inventoried so far ranges from 1988 to 1994; and while we were hoping for some earlier materials from the Association, the years we have provide insight into the social conditions for African Americans in Charleston and South Carolina. The types of letters found in the collection include thank-you letters, cards, calls for boycotts of stores, media outlets, and petitions. 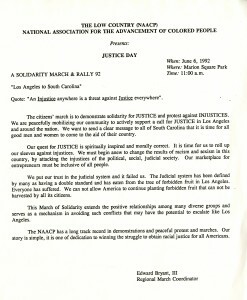 In addition, there are memorandums from the NAACP National Branch about what issues are important to the branch, such as the Benjamin Hooks controversy and Clarence Thomas’s appointment to the Supreme Court. 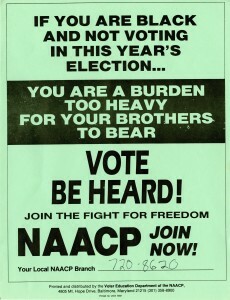 The collection contains some copies of the NAACP’s Crisis Magazine (circa 1980s) as well as the local branch newsletter sent to the members of the organization. There are records detailing special programs and events undertaken by the association such as their Annual Freedom Fund programs, the ACT-SO Golf Classic, the 1992 Gospel Concert, and the NAACP Annual Conventions (regional and national). As one would imagine, the social issues of politics, education, and voting comprises a lot of the collection. 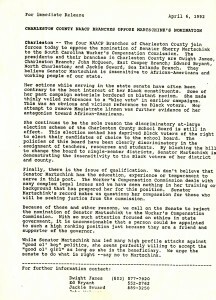 Records of note are those that detail statistics about the number of African-American teachers in the Charleston County School System; the number of Black politicians in South Carolina; the importance of voting for Black politicians; the need for minority businesses in South Carolina and particularly Charleston; media biases; and efforts relating to the struggle to take down the Confederate flag from the state house dome. Other important records include the rules, constitution, branch manual of the NAACP; the meeting minutes and the agendas for the branch executive board, general body, and various committees; membership lists, officer positions, and membership drive information; local and national newspaper clippings; and records relating the NAACP’s role in helping the community rebuild after Hurricane Hugo hit Charleston in 1989.